The University of Delaware’s Bingjun Xu has been named to the 2018 Class of Influential Researchers by the journal Industrial & Engineering Chemistry Research. He is one of 29 scientists and engineers from eight different countries to make the list. Xu, an assistant professor in the Department of Chemical and Biomolecular Engineering, studies catalysis — the processes that accelerate chemical reactions. If you drive a gas-fueled automobile, then you benefit from catalysis every time you’re behind the wheel. A catalytic converter inside the car uses a catalyst, often platinum, to convert dangerous carbon monoxide into carbon dioxide. College of Engineering Assistant Professor Bingjun Xu was an undergraduate student in chemistry at Fudan University in China. He earned a doctoral degree at Harvard, completed a post-doc at the California Institute of Technology, and came to UD in 2013 to continue studying catalysts. As part of Xu’s recognition in the 2018 Class of Influential Researchers, an article co-authored by Xu and three colleagues at the Catalysis Center for Energy Innovation — Matthew J. Gilkey, Casper Brady, and Dionisios Vlachos — is featured in a special issue of Industrial & Engineering Chemical Research. The team developed a tool to determine the oxidation state of catalysts, providing a glimpse into what happens as a catalyst is being spent. This is typically difficult to measure, especially in reactions that take place at high temperatures and under high pressures. “We could always analyze the catalyst before we used it or after we used it, but the most important information comes from when the catalyst is actually doing its job,” said Xu. The team detailed their design in the article so that other scientists can try it, too. “Every single component in this instrument we built is widely used, but they haven’t been put together this way before,” he said. Xu also recently published two articles in the Journal of the American Chemical Society. In one new paper, UD engineers and collaborators from Brookhaven National Laboratory and Columbia University showed how nanoparticles of the compound vanadium nitride can be used to produce ammonia, a chemical commonly used in fertilizers, from nitrogen. “We discovered that vanadium nitride is a very good catalyst that is able to turn nitrogen in the atmosphere to ammonia at close to room temperature with electricity,” he said. This technology is still far away from practice, but it is a breakthrough over previously studied methods. In another paper, Xu and colleagues at Brookhaven National Laboratory wrapped a porous layer of zeolite, a catalytic mineral, around metal nanoparticles so that only some outside materials could reach the metal inside. This allows for tandem catalysis, where multiple catalysts are used together to make a reaction happen even faster or more efficiently than before. 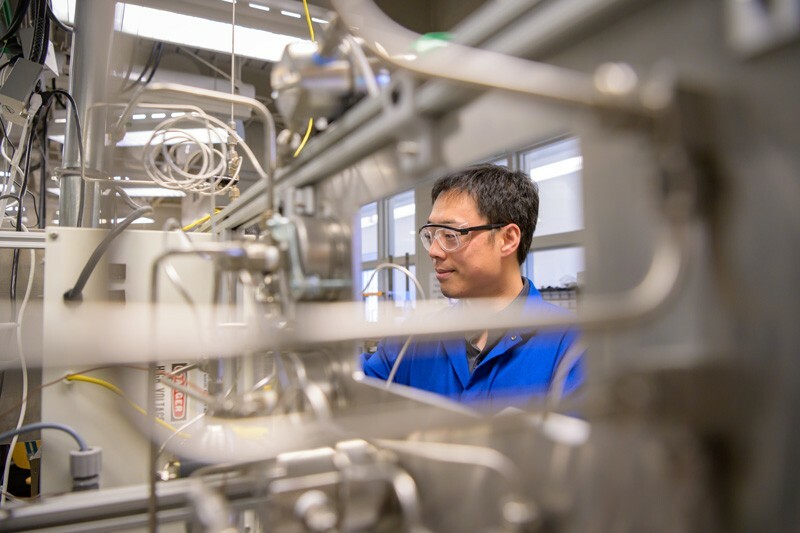 Many catalytic reactions take five to seven steps, and each requires separation and purification steps, but “with tandem catalysis, we can combine two reactions in one reactor so that we don’t have to go through costly separation steps,” said Xu. Tandem catalysis could also reduce the environmental footprint of common industrial chemical reactions by reducing the need for solvents. The potential applications of Xu’s work with catalysts are far-ranging. By understanding catalysts, scientists such as Xu can more effectively use them to transform plant matter into plastics and fuels, reduce atmospheric carbon dioxide into valuable chemicals, or reduce atmospheric nitrogen to ammonia. All of these technologies could allow for more sustainable production of goods with less pollution to the environment. Xu, who describes himself as a surface scientist, was first intrigued by catalysis as an undergraduate student in chemistry at Fudan University in China. Like most students, he learned that catalysts were somewhat magical materials because of their ability to accelerate chemical reactions. “I wondered: What is going on with this magical material?” he said. 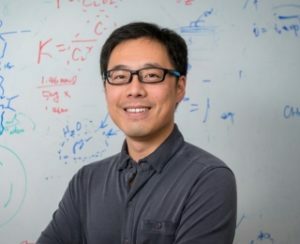 “This is how I first got hooked.” After earning a doctoral degree at Harvard and completing a post-doc at the California Institute of Technology, Xu came to UD in 2013 to continue studying catalysts. Xu collaborates with Dionisios Vlachos, the Allan and Myra Ferguson Professor of Chemical and Biomolecular Engineering; Yushan Yan, Distinguished Engineering Professor of Chemical and Biomolecular Engineering; Raul Lobo, Claire D. LeClaire Professor of Chemical and Biomolecular Engineering; and Feng Jiao, associate professor of chemical and biomolecular engineering. Jiao was named to the 2017 Class of Influential Researchers by the journal Industrial & Engineering Chemical Research. Xu credits his collaborators as well as his lab group, which includes graduate students and postdoctoral associates, for much of his success. Xu receives funding for his research from the Department of Energy Office of Basic Sciences and NSF EPSCoR.